There are a lot of games to download on the App Store. As in, about a hundred thousand. I’ve played hundreds of games on my iPad and iPhone over the years, and I’ve really enjoyed a ton of them. But this week, I may have just found my favorite. Between 2012 and 2013, the App Store has been going through a bit of a transition. With Super Hexagon probably marking the crux of the change, iOS games have been gaining respect as a medium to deliver quality gaming experiences. Super Hexagon ended up being features on several Game of the Year lists last year, and for good reason, it was clearly competitive with just about anything else on the market. Earlier this year, we had Year Walk. It’s been hailed as another champion of iOS maturation, giving players a high-quality experience on par with the quality of any other platform. Today, I’m here to sing the praises of a new game, one that should once and for all, demolish “classes” of platforms to play a game on. If a game is great, it doesn’t matter if it’s on your phone, your television, or your watch. 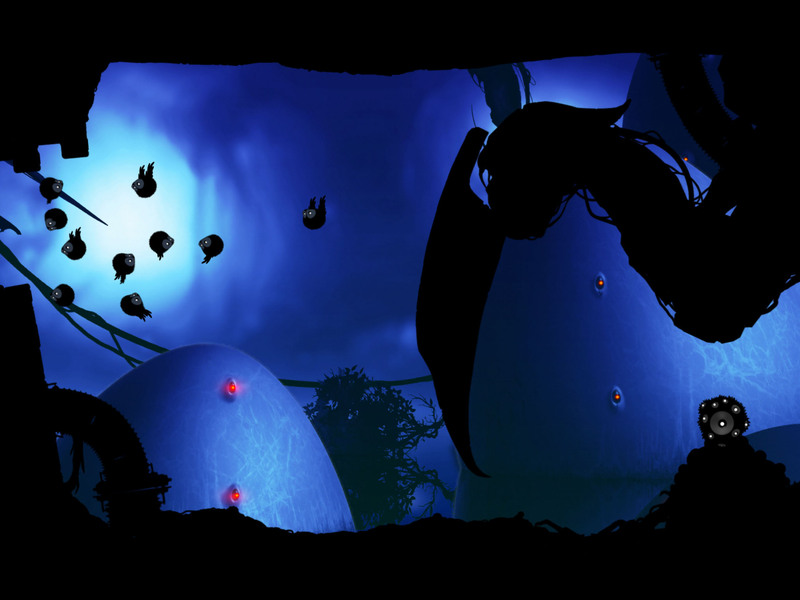 Badland is here to tear away any hesitance you had towards jumping on board the mobile gaming train, and it’s ready to be hailed as a defining moment for Tablet gaming. 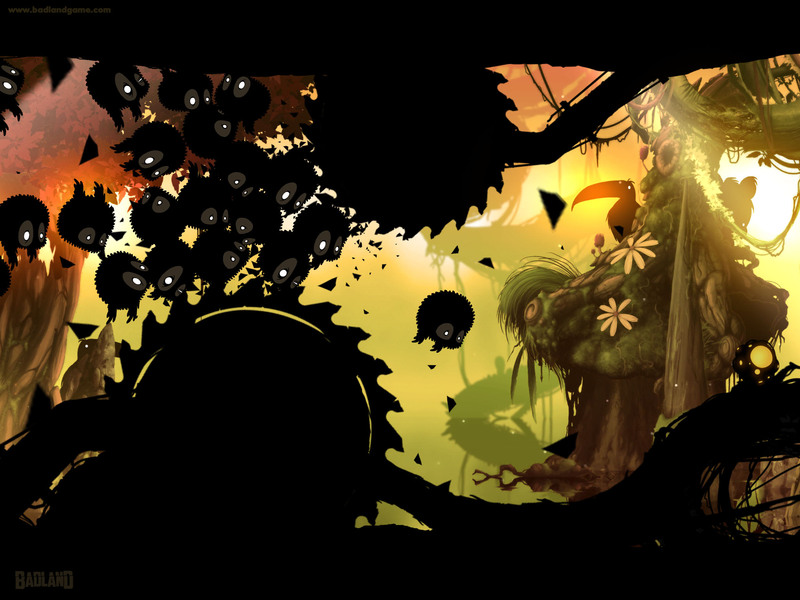 Badland is brilliance refined to its very essence. It is, arguably, the best game currently available on the iPad, and one of the best platformers I’ve ever played anywhere. 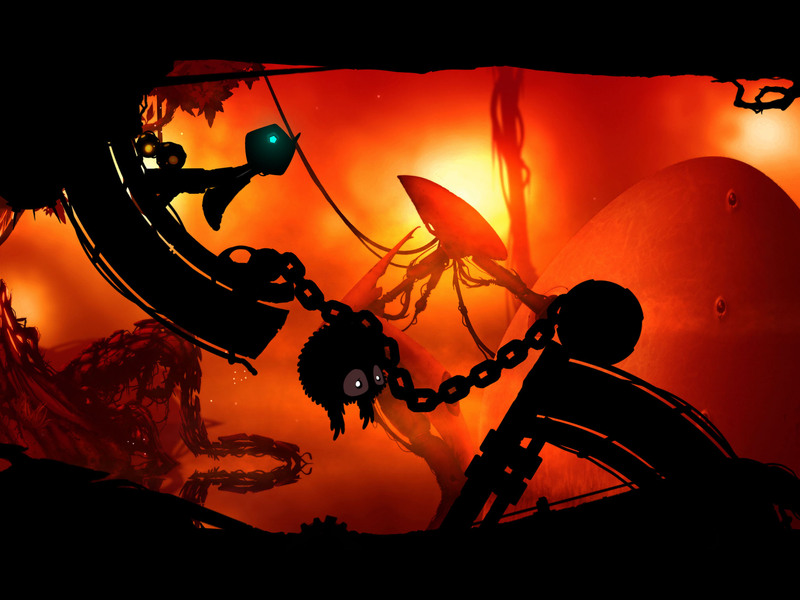 Badland creates a brand new amalgamation between two well trodden genres, the auto-runner and the puzzle platformer. Auto-runners have proven very successful in recent years, popularized by Adam Atomic’s Canabalt. Since then, there have been hundreds upon hundreds of games flooding the genre. Some are great, some aren’t. Badland is an evolution of the genre, transcending its tropes and giving it a much needed spark of life. You play as a strange, round creature who can fly by flapping its arms. The game has one means of player interaction, you touch the screen. The entirety of the game revolves around a one-button control scheme that seems incredibly simple upon first glance. Well, it’s not, at least, not entirely. The first thing you’ll notice is how beautiful the environments are. As you fly through the first level, you eyes will be constantly distracted by the gorgeous backdrops, and the odd creatures that reside in them. “The water looks beautiful. Wait, is that a bunny?” The second thing you’ll notice is that you’ve either been squished to death by a rock, crushed inside a spinning gear, or mangled by a rotating propeller. The deaths come brutal and fast, and you’ll experience many more as you learn to navigate the levels ahead. The level design itself astounded at just about every turn. The 2D levels themselves are meticulously pieced together to feel alive as you flow through them. Rocks will crumble from above, vines will unfold from ledges as you bump into them, and many more things that you deserve to experience for yourself. It isn’t entirely cosmetic either, as you’ll learn after playing through the first dozen or so levels. Pieces of the environment play directly into solving puzzles. The levels get more frantic as you progress, leading me to describe Badland to friends as “the Uncharted 2 of platformers.” Every level is a chock full of action setpieces, and just when you think it’s going to rely on ideas from previous levels, it throws another twist made just to blow your mind again. It manages to keep a roughly 3 or 4 hour campaign fresh, because you never, ever know what’s about to happen. The large-scale attractions aren’t the only spectacle draw of the game though, as the attention to every small detail intrigues as well. The little guys you control have tons of character. Their eyes wince as they’re close to being pulled off-screen to their death, and they grimace in anger if they’re stuck with spiked vegetation that comes from some plants. As you fly through the levels, it’s easy to miss some of the level of polish the game has, but it’s been perfected down to the pixel. Puzzles don’t take too much of a backseat to the action though, they aren’t as substantial as the platforming action, but there’s enough of the to feel satisfied. For example, a piece of rock may fall in front of you, and then there might be a dead end. As you’re flying, you may need to push the rock into a small hole in the ground to activate a switch that unblocks the path ahead. The puzzles get more intricate later on, making you push your brain a little more than a standard platformer. Bear in mind that you never stop moving to the right side of the screen, so all of this must be done as you’re soaring through the level. It requires you to take action on the move, or die and do better next time. Death is hardly a punishment though, as it takes less than three seconds to set you back into the game, and the checkpoints are gracefully placed just before every single point of possible death. The harshest punishment from a standard level will only ask you to redo a five second portion just before you died, and then send you on your way. I use the word “standard” because some levels at the tail end of the game require you to play without checkpoints. They are relatively short, and are focused on quick reaction times to navigate environments efficiently Even these levels will only send you back 30 seconds or so, are are so fast paces I enjoyed retrying them after half a dozen deaths. Powerups are a key feature of the game, and enhance player interaction with the levels dramatically. Rather than mindlessly floating through the levels, you’re tasked with picking up certain power ups scattered around in order to get through certain areas. You begin collecting abilities to shrink, grow very large, and multiply, along with around half a dozen other abilities that are just as fun to use. Every powerup is significant and fun to use, but the multiplication is one of the shining examples of what sets this game apart from other platformers and runners. In some levels, you’ll end up with ten, twenty, fourty, or more controllable characters on the screen at one time. All of them react exactly the same to the controls, but are on different portions of the screen. You’ll still be required to navigate through gruesome environments, which inevitibly will end with the deaths of plenty of your comrades. More times than I could count, I would have a huge group of little creatures flying around. I’d focus my eye on one or two of the little guys, and steer them as best I could through buzz saws and other dangers. At the end, I’d usually have one single creature left, one left of dozens who managed to survive the trial. He was almost never the one I was originally focusing on, and sometimes I’m not even sure how he made it. Sometimes it feels like you scraped by with every ounce of skill you could muster, other times it feels like blind luck. It’s indescribable how simultaneously awesome and terrible it feels to lead your team through and see that one lucky soul make it out alive. You nearly killed your entire squad just to get to this point… but somehow you actually survived. The game starts out on a bright and sunny morning, but holds a hint of something more sinister waiting just behind every corner. The entirety of the game takes place over the course of that one day, and by nighttime…nothing feels the same any more. Without ruining much, the difficulty curve lines exactly up with the events of the story, leading to some intense revelations. Badland never utters a single word or line of text, and manages to deliver a poignant tale that spun my mind into a hundred different directions. 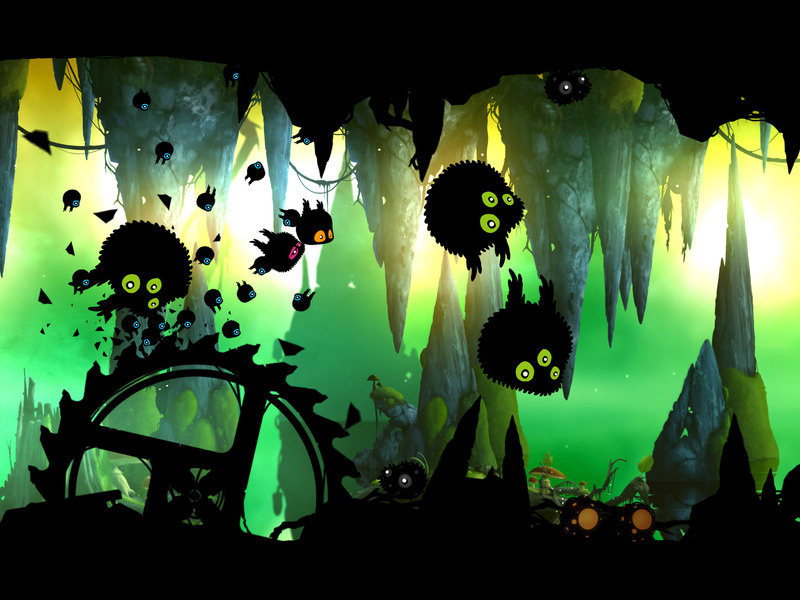 Badland’s soundtrack is made up almost entirely of ambient noises that are natural for the levels you’re in. You’ll hear birds chirping, bugs humming, and as the sun begins to go down, some darker, louder, and more aggressive noises take over. There is also a 4-player multiplayer available and it’s played entirely on one screen. Each person takes one fourth of the iPad screen, and uses it as their control for their character. There are 12 levels specifically designed for multiplayer, and it’s the most fun I’ve had playing with friends this year next to Super Stickman Golf 2. It’s a race to the finish, but you can use powerups to try and take out the other players quicker. In one instance, I grew so large and multiplied so many times, my characters began to crush everyone else on the screen, leading me to victory. Laughs will be had, and you’ll replay the levels again and again. This multiplayer mode is quite the opposite of a throwaway, and is a wonderful addition to an already perfect game. It’s a great way to introduce friends, because it’s basically modified single player levels designed for up to four people. If you’re not into Badland to play one of the best solo experiences of the year, you should definitely give the excellent multiplayer a shot. Badland is in my running for Game of the Year along with BioShock Infinite, Antichamber, and other wonderful games. Just because it’s a $4 iOS game, that isn’t any reason to pass it up if you’re trying to find the best games of the year. You won’t have a better time anywhere else, so drop in your minuscule entry fee and play Badland until the sun goes down. 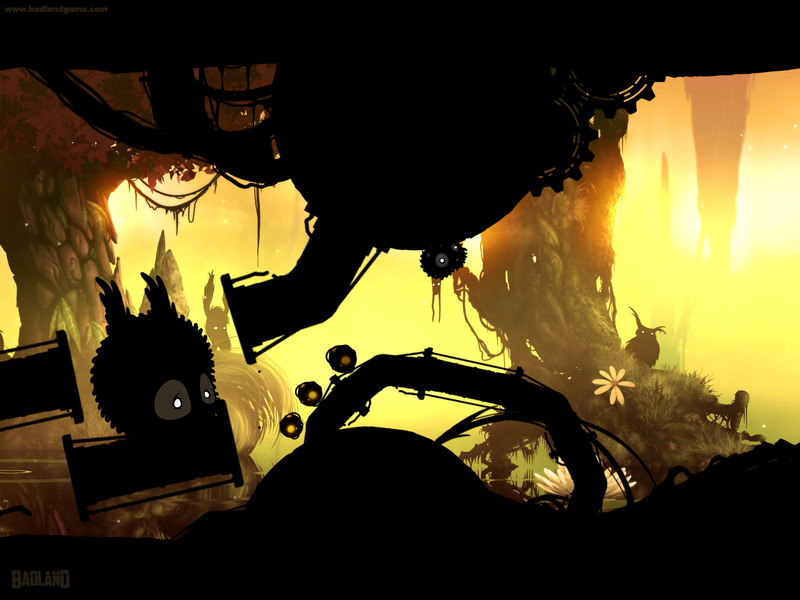 Tags: Badland. Bookmark the permalink.